I found these while researching for a forthcoming article about a sister-ship of HMS Spartan. HMS Spartan was an 18pdr armed, 38 gun, 5th rate Frigate of the Lively Class, built under contract by Charles Ross at his shipyard at Acorn Wharf, Rochester, on the banks of the River Medway. The site of Ross's shipyard is now occupied by the Acorn Shipyard. The Lively Class was a group of 16 large sailing frigates designed by Sir William Rule. They were very similar to another of his designs, the Leda Class. Both classes were based on the design of a French frigate, the Hebe, captured in 1782 towards the end of the American War of Independence. In terms of their combination of speed, manoeuvrability and firepower, the Lively Class are widely considered to be the most successful British frigate design of the period. HMS Spartan was one of two ships of the class to be built by Charles Ross. The other was HMS Resistance, launched on 10th August 1805. Exactly two weeks after he had launched HMS Resistance, Charles Ross received an order for an identical ship. The first keel section for the new ship, to be named 'Spartan', the first Royal Navy ship to bear the name, was laid on the slipway at Rochester in October of 1805. HMS Spartan was launched, her hull complete, into the River Medway on Tuesday 16th August 1806 and after her launch, was towed the mile or so downstream to the great Royal Dockyard at Chatham. There the ship was dry-docked, her lower hull was sheathed in copper and her guns, masts and her miles of rigging were fitted. The ship was loaded with her many tons of stores and took on her crew. As soon as she arrived at Chatham, the ship was commissioned into the Royal Navy under Captain George Astle. Captain Astle was an experienced commander whose previous appointment had been in command of the ex-French 38 gun frigate HMS Virginie. Fitting out was completed on Monday 6th October 1806. On completion, HMS Spartan was a ship of 1,084 tons. She was 154ft 2in long on her gundeck and 129ft 6in long at the keel. She was 39ft 8in wide across her beam. The ship drew 10ft 4in of water at the bow and 15ft at her rudder. Her hull below the orlop was 13ft 6in deep. The ship was armed with 28 18pdr long guns on her gundeck, 2 9pdr long guns and 12 32pdr carronades on her quarterdeck, 2 9pdr long guns and 2 32pdr carronades on her forecastle. In addition to these, she carried a dozen or so half-pounder swivel guns mounted on her upper deck handrails and in her fighting tops. The ship was manned by a crew of 284 officers, men, Royal Marines and boys. Although officially rated as a 38 gun ship, she actually carried 46 guns. A model of HMS Lacedaemonian, also a Lively Class frigate. HMS Spartan would have been identical. Notice how the gangways linking the forecastle and the quarterdeck are wider and the space between them, the boat booms, are grated over. This creates the impression of the ship's upper decks being an almost continuous space, very similar to the large spar-decked frigates built a few years earlier by the United States Navy. Also notice how the ship's decorations are on a far less lavish scale than older ships. Since about the end of the Seven Years War in 1763, ships were fitted with less and less decoration so that by the time HMS Spartan was built, it was almost non-existant. After commissioning, the ship was assigned to the Channel Fleet and was in the Channel Islands when Captain Astle was replaced in command by Captain Jahleel Brenton. Jahleel Brenton's life story is probably worth a book in itself. Born in the Rhode Island Colony in 1770, his father, also Jahleel, was serving in the Royal Navy as a Lieutenant when the American War of Independence broke out. The family were loyalists in the war and with the war going badly for the British and the Loyalists, the family emigrated to the UK in 1780. Jahleel Jr. joined the Royal Navy at the age of 11 in 1781 aboard the hired armed vessel 'Queen' of 20 guns, not to be confused with the second rate ship of the line of the same name. Queen was commanded by his father, who had been appointed Master and Commander in her. He would have joined the ship as a cabin servant, probably to his father, with a nominal rank of Able Seaman in order to get the required sea-time (2 years) to enable him to be appointed as a Midshipman and begin training to be an officer and potential commander in the Royal Navy. His father's influence kept him in the Royal Navy when the war ended and he was serving as a Midshipman in the 74 gun third rate ship of the line HMS Bellona when he passed his examination for Lieutenant in March 1789. Unable to get an appointment in the Royal Navy, Jahleel Brenton signed on as a Lieutenant in the Swedish Navy at a time when Sweden was at war with the Russians. After briefly serving in the Swedish Navy and seeing action at the Battle of Svensksund, he rejoined the Royal Navy during the mobilisation for the Spanish Armaments Crisis. From there on, his career was a case of being in the right place at the right time. In 1797, he received an appointment as First Lieutenant in HMS Aigle, but was unable to get a passage to that ship so accepted a temporary appointment in the 98 gun 2nd rate ship of the line HMS Barfleur. Whilst on that ship, he participated in Sir John Jervis's astonishing victory over the Spanish at the Battle of Cape St Vincent. After that battle, Brenton was offered and accepted the post as HMS Barfleur's First Lieutenant. Later in 1797, Jervis, by now elevated to the peerage and known as the Earl St Vincent, had sent his flagship, the 100 gun first rate ship of the line HMS Victory home, as she was in poor condition. HMS Victory was replaced by the brand new 110 gun first rate ship of the line HMS Ville de Paris. The young officer was offered and accepted an appointment as the new flagship's First Lieutenant. After this, further promotion and a command of his own were a certainty and sure enough in January 1799, Brenton was appointed as Master and Commander in the 14 gun brig-sloop HMS Speedy. Promoted to Captain in 1800, he was appointed as Flag Captain to Vice-Admiral Sir James Saumarez in the 80 gun third rate ship of the line HMS Caesar. Once again, he was in the right place at the right time and after Saumarez's victory over a Franco-Spanish force at the Second Battle of Algeciras, a plum appointment was his to be had. Unfortunately for Brenton, the war ended in 1802 and he was laid off. With the resumption of war in 1803, the plum appointment came his way and he was appointed to command the ex-French 38 gun frigate HMS Minerve, part of a squadron commanded by Saumarez operating out of St Peter Port, Guernsey. HMS Minerve ran aground off Cherbourg in 1803 and was recaptured by the French and her crew including Captain Brenton, were taken prisoner. HMS Spartan was Brenton's first command after being released by the French under a prisoner exchange deal in 1806. As soon as Saumarez heard that Brenton was available, he offered him command of HMS Spartan and her new captain took up his appointment in February 1807. Captain Brenton was also a talented artist and many of the paintings of the ship were either painted by him personally or were based on his sketches . In March 1807, Captain Brenton and his ship received orders to proceed to the Adriatic Sea, to participate in what would be a long campaign for the Royal Navy. In 1807, the Kingdom of Italy (then the north-eastern part of modern day Italy), the Kingdom of Naples (now the southern half of modern-day Italy) and the Illyrian Provinces (modern-day Croatia) were controlled by the French. This control gave them an advantage in moving troops to the Balkans and to Austria and also gave them control of the large shipyards in Venice. The British were determined to disrupt this and had begun to move frigates to the area. On 14th and 15th May 1807, HMS Spartan had not one, but two brushes with disaster. In the morning of the 13th, HMS Spartan had chased a large Polacca off Nice, which at the time of being sighted had appeared to be unarmed. The chase had gone on all day and through the night. When the wind died away early in the morning of the 14th, Captain Brenton decided to send 70 of his best men in boats after the enemy vessel. The mission was commanded by the ships two most senior lieutenants, Mr Benjamin Weir and Mr Woodford John Williams. At about 10am, after having rowed the five or so miles from their own ship to the target vessel, the British boats came alongside the vessel at her bow and stern and attempted to board. What they didn't know was that the enemy was ready for them. Boarding nets had been rigged and the French crew, armed to the teeth, had also loaded their vessels main guns with grapeshot. When the enemy opened fire, only seven of the British sailors was left unhurt and 26 men were killed. The remaining men managed to get the boats back to their ship. One of the men, a Petty Officer, James Brodie was keeping a journal and of the attack, he wrote "I, James Brodie, Quartermaster belonging to HM Ship Spartan under the command of Capt. Brenton was sent from said ship under the command of Lieutenant Benjamin Weir after a large ship inshore. Which, at 10am, we went alongside of her, and on seeing the boat, the enemy called to all hands, the same as a British man of war. Which Mr Weir ordered me to stop for the rest of the boats. Accordingly, I did so. The jolly boat and the cutter was a long way off then. The launch came up and it was agreed among the officers to board her. At a distance of a pistol shot off her, the fire began. Which, I steered the boat that Mr Weir was in, and laid him on the starboard quarter according to his orders. Which, we was under a very hot fire for a considerable time. I jumped in the mizzen chains and went forward without being discovered by anyone. I spiked 4 of the guns on the starboard side with the ramrod of my pistol. The boats shifting off, I was discovered by a small boy that was coming up the fore hatchway who called out "Engles, Engles", upon which I was directly attacked by the captain and some of her seamen. After some time, I was surrounded by the whole ships company and being wounded in the back and legs and seeing my shipmates flee from me, thought it best to make them understand that I was a prisoner of war." It was only noticed that Brodie was missing when the remaining men got back to their ship. It must be stated at this point that such was the shortage of men in the Royal Navy, that some captains had resorted to accepting women volunteering for service at sea. Many of the women serving at sea were the wives of sailors who had been pressed into service. HMS Spartan was one of those ships and James Brodie was one of the men whose wife was also serving in the ship. When the dead men were laid out on the main deck, Brodie's wife searched for her husband and became delirious when told by the survivors that they were sure they had seen him wounded and fall between the enemy ship and his boat. She had climbed into his place on the ships barge and was only removed with difficulty. When the ship arrived at Malta, a subscription had raised 80 guineas for her and the money was used to return her to her parents in Ireland. Later on, it was discovered that a polacca had indeed gone into Nice after having driven off a British attack from boats and that the British had left behind a wounded man who had been taken prisoner and after the vessel had arrived, was sent to a prison in Verdun. As things turned out, Brodie was kept in the same prison that Captain Brenton had been kept in and he used his connections in that prison to confirm in writing to Mrs Brodie that her husband was alive and well. After spending four years as a Prisoner of War, James Brodie and his wife were reunited and they went on to serve together on the Royal Yacht HMY Royal Charlotte. Among the dead or mortally wounded were both the ships senior Lieutenants, Mr Weir and Mr Williams. If this disaster were not enough, the following day, HMS Spartan had a narrow escape when she encountered a French force comprising the 74 gun ship of the line L'Annibal, the 40 gun frigate Pomone, the 38 gun frigate Incorruptible and the 14 gun brig-corvette Victorieuse. This provided the British with some useful information. L'Annibal had previously been the British 74 gun ship HMS Hannibal, which had been captured after having been crippled, badly damaged and forced to surrender at the First Battle of Algeciras. It seemed that the French had repaired the ship and had managed to put her into service. After sighting the French force, Captain Brenton decide to keep an eye on them through the night, but the following morning the French gave chase. HMS Spartan ran along the east side of the island of Cabrera, pursued by L'Annibal, while the frigates and the corvette went around the other side of the island in hope of cutting her off and trapping her. HMS Spartan found herself trapped by the pursuing enemy ship of the line and the oncoming frigates. With HMS Spartan lying becalmed in the lee of the island and the French frigates coming on under their momentum, the leading frigate fired a full broadside at HMS Spartan. The recoil of the guns stopped the French ship dead in the water. Wreathed in thick gunpowder smoke, the French lost sight of Captain Brenton's ship and he used the opportunity to make his escape. On 7th February 1808, the French Admiral Ganteaume sailed out of the naval base at Toulon with a fleet comprising ten ships of the line, three frigates, two corvettes and seven armed transport ships carrying troops, provisions and stores. Among the ships of the line was the Commerce de Paris, a gigantic brand new ship of 120 guns, in which Ganteaume was flying his command flag. Ganteaume's fleet arrived off the island of Corfu on 23rd February and he immediately sent detachments of his smaller vessels to neighbouring ports with instructions to bring more supplies to Corfu. The French landed their troops and provisions on Corfu. While lying at Corfu, Ganteaume's fleet was struck by a storm which severely damaged the Commerce de Paris in her masts and rigging, so much so that the French Admiral was forced to shift his command flag to the Magnanime (74) to lead his fleet on a cruise through the Ionian Sea, leaving the Commerce de Paris at Corfu to make her repairs. The fleet returned to Corfu on 15th March. Ganteaume's arrival at Corfu had not gone unnoticed by the British. On 23rd February, the 22 gun post-ship HMS Porcupine also arrived at Corfu; she was due to rendezvous with the 64 gun third rate ship of the line HMS Standard. 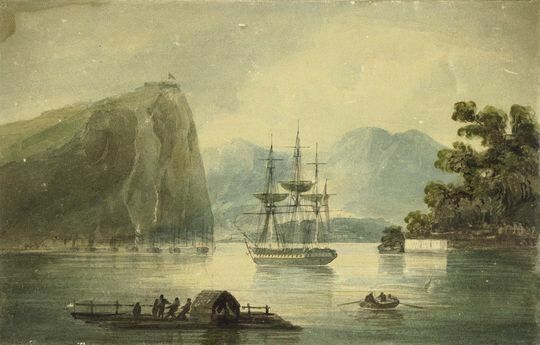 What Captain the Honourable Henry Duncan of HMS Porcupine didn't know was that HMS Standard had already left Corfu having also spotted the arrival of Ganteaume's fleet and had gone in search of the Commander-in-Chief, Admiral Lord Collingwood. Having spent the 23rd watching the French to gather as much intelligence about them as possible, HMS Porcupine also left Corfu and went in search of reinforcements. On 24th February, HMS Porcupine met up with HMS Active (38) and from 26th February until 13th March, the two ships followed Ganteaume and his fleet on their trip around the Ionian Islands. On 16th March, Ganteaume re-hoisted his command flag aboard the Commerce de Paris and sailed again with his whole fleet, this time, following a course along the coasts of Africa, Sicily and Sardinia. For this trip, he was followed by HMS Spartan, which had been sent on 23rd February by Vice-Admiral Thornborough. Thornborough had been seeking to gain intelligence about a squadron of French ships of the line under Admiral Allemand which had broken out of Rochefort. Captain Brenton and his ship had been passing Malta when they had gained intelligence from a Maltese trader about Ganteaume's force. HMS Spartan joined with the main body of the British Mediterranean Fleet under Lord Collingwood off Maritimo on 3rd March. Lord Collingwood dispatched HMS Spartan to Palermo, where she was to join a squadron under Rear-Admiral Martin with three ships of the line. The Rear-Admiral ordered Captain Brenton to patrol between Cape Bon and Sardinia and it was while on that patrol on 1st April that they discovered the French fleet under Ganteaume. Captain Brenton placed his ship upwind of the French at a range of about six miles and followed them. Very quickly, HMS Spartan found herself being chased by the enemy. In the evening of 1st April, HMS Spartan heaved-to and Captain Brenton sent the ship's launch under Lieutenant Coffin on a journey to the port of Trepani, 130 miles away, with despatches. Proceeding under sail, Lieutenant Coffin was forced to lower his sails and sit quietly in the water while the French fleet sailed past him. He reached Trepani the following morning and passed on his despatches. Following his orders, the launch then headed off to Malta and arrived there on the third day. In the meantime, the enemy kept up their pursuit of HMS Spartan. After four days of being chased by the French, the wind changed and rose in the evening and in the poor weather, HMS Spartan lost contact with the enemy. By October 1808, HMS Spartan had embarked a company of troops from the 35th Regiment of Foot under Major Charles William Clarke. The ship was one of a number of British ships engaged in an 'island-hopping' campaign in the Greek Islands, ejecting the French from a succession of islands. In that month, the island of Cerigo was liberated by Major Clarke and his men, assisted by seamen from HMS Spartan. By April 1809, Captain Brenton had been appointed to command a small squadron, which also comprised the 18pdr armed 32 gun frigate HMS Amphion and the old 9pdr armed 28 gun frigate HMS Mercury. On 23rd April, the three frigates were patrolling off the town of Pesaro, in the Gulf of Venice when a large number of vessels were seen lying in the harbour. Captain Brenton decided that it was possible to take these vessels. To carry out the attack, he ordered that the three frigates anchor off the town and launch their boats. He placed the whole force under the command of his First Lieutenant, Mr George Wickens Willes. The boats were divided into two divisions. The first division, comprising the largest boats, the launches, had been fitted with carronades taken from the ships and other boats fitted with field guns and was placed under the command of Lieutenant Charles George Rodney Phillott, the First Lieutenant of HMS Amphion. The second division, comprised of boats fitted with Congreve Rockets, was placed under the command of Lieutenant William Augustus Baumgardt of HMS Spartan. The first division was ordered to take position to the north and the second to the south. Once all was ready, Captain Brenton sent a flag of truce into the harbour with a message for the Governor demanding the surrender of all the vessels in the harbour adding that if the town offered any resistance, they would suffer the consequences. At 11:30, the boat returned with a message stating that the British should have an answer within half an hour. Thirty-five minutes later and on seeing troops gathering in the streets and the locals beginning to dismantle the vessels in the harbour, Brenton ordered the flag of truce to be hauled down and ordered the boats and all three ships to open fire on the town. After about half an hour of firing, flags of surrender were seen to be being hung out in the town. Lieutenant Willes was sent into the harbour to accept the surrender, only to be told that the Governor had fled, taking all the troops with him. Considering the town surrendered, Captain Brenton ordered the boats into the harbour to take possession of all the vessels. At 18:30, 13 vessels were brought out, all deeply laden. At 19:00, the castle guarding the entrance to the harbour was blown up. Not a single British life had been lost. In fact the only known fatality in the whole operation was a man in the castle who had ignored all British warnings to leave and was buried in the rubble when the castle was blown up. A week later, HMS Amphion had been detached from the squadron in order for her captain, William Hoste, to take command of a squadron of his own. Hoste was later to command his squadron in a spectacular victory against a far superior Franco-Venetian force in the Battle of Lissa in 1810. HMS Amphion had not been replaced in the squadron, leaving Captain Brenton with just his own ship and HMS Mercury. 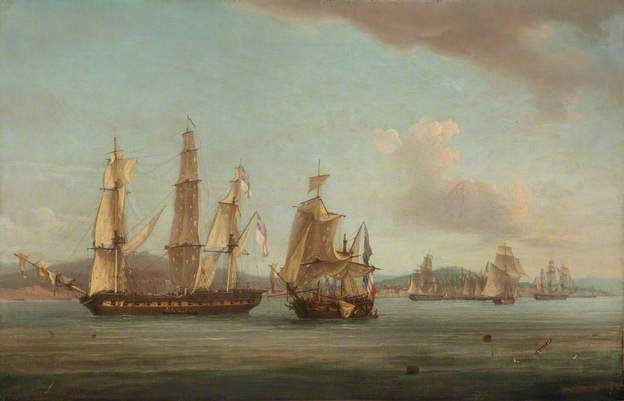 On 2nd May, the two frigates chased a pair of vessels into the harbour at Cesanatico. This harbour has a very narrow entrance which at the time was defended by a castle and a shore battery mounting a pair of 24pdr long guns. This and the shoaling nature of the sea-bed meant that it ws too dangerous for the British frigates to approach within range of the port unassisted. Captain Brenton was confident of being able to take possession of all the vessels in the harbour, so ordered that two of HMS Spartan's boats lead the way in and that they should signal when the depth of water reached three fathoms. This way, feeling thir way slowly in, the two frigates were able to anchor within grapeshot range of the shore battery, which was very quickly silenced. 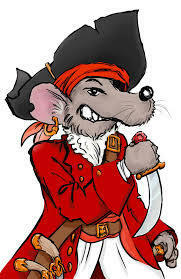 Once again, Lieutenant Willes led the boat attack on the harbour. Under his leadership, the guns of the shore battery were turned on the town and the castle, which were quickly deserted. This time, HMS Spartan's haul was 12 vessels, some empty, the others laden with corn for Venice. The castle and the battery magazine were blown up, the battery was destroyed and HMS Spartan's men left the town having not suffered a single casualty. In an effort to move closer to the town so that he could better use his smaller guns, Captain the Honourable Henry Duncan managed to run HMS Mercury aground, though she was safely refloated later in the day. Almost a year was to elapse before HMS Spartan and her crew saw any more action. By 25th April 1810, HMS Mercury had been replaced in the squadron by another old frigate, the 12pdr armed 32 gun frigate HMS Success. The squadron had also been joined by the 18 gun Cruiser Class brig-sloop HMS Espoir. On that date, the squadron was patrolling when they sighted a ship, three barques and a number of feluccas at anchor under the castle at Terrecino. Brenton ordered his squadron to make all sail towards the town and on arrival off the harbour, ordered the squadron's boats into the harbour in order to take possession of the vessels in it. The attack was to be led by Lieutenant Baumgardt of HMS Spartan, assisted by Lieutenant George Rose Sartorius of HMS Success. The squadron approached the harbour, led by HMS Espoir, which was feeling her way in with lead and line until they were directly under the shore batteries. On anchoring, the three vessels then began a furious bombardment of the enemy's positions ashore and the shore batteries guarding the harbour. In the meantime, Lieutenant Baumgardt led his men into the harbour under severe fire and boarded the ship, which was strongly defended by her crew. Eventually, the enemy surrendered and the Baumgardt's men quickly took control of the other vessels in the harbour and brought them out. In this action, the British suffered casualties of one dead and four wounded. By this time, Joachim Murat, Napoleon's brother-in-law had been installed as King of Naples and had assumed the title 'Prince Murat'. He was an accomplished general in his own right and took an active role in the government of the Kingdom of Naples. On 1st May 1810, HMS Spartan was in company with HMS Success, Captain Brenton having detached HMS Espoir on an errand. At 17:40, they sighted enemy vessels, a frigate, a large corvette, a brig and a cutter in the Bay of Naples. The two British frigates crowded on all sail and made off in chase of the enemy. At about 19:00, the enemy vessels went about and made all sail for Naples. They were chased right up to the harbour wall by the two frigates. Daylight the next day saw the Neopolitan squadron at anchor in the harbour and the two British frigates in the mouth of the Bay of Naples. Captain Brenton was sure that the enemy would not put to sea while both his ships were in sight, so to entice the French out, he sent HMS Success away to a rendezvous point off the island of Capri. 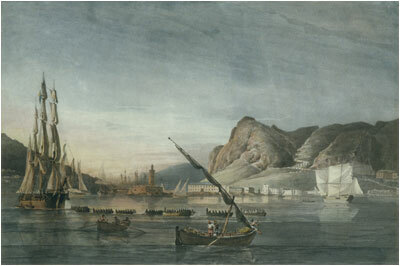 The Royal Navy's blockade of Naples was badly hurting commerce and Prince Murat was determined teach the British a lesson. To that end, he ordered some 400 Swiss troops to board the frigate and the corvette and that seven large gunboats, each armed with an 18pdr long gun, be prepared. The force was ordered to sail at dawn and take the British frigates. The Neopolitan force therefore comprised the 18pdr armed 40 gun frigate Ceres, the 12pdr armed 28 gun corvette Fama, the brigantine Sparviero with 10 guns and the armed cutter Achille, also with 10 guns, in addition to the gunboats. Altogether, the enemy force possessed 95 guns and over 1400 men versus HMS Spartan with a total of 46 guns and 258 men. 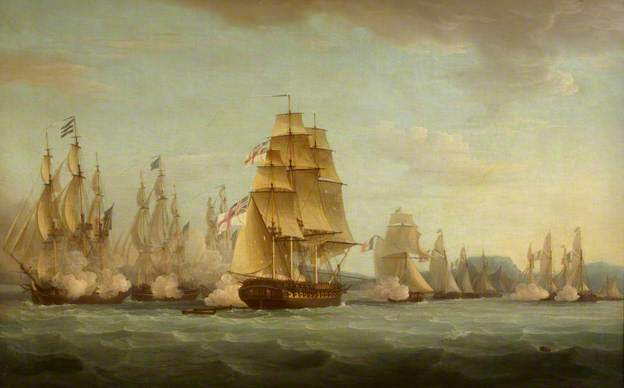 HMS Spartan's action against the Neopolitan Squadron - The Beginning of the Action by Thomas Whitcombe. Taken from a sketch by Captain Jahleel Brenton. At 07:00, the Neopolitan Squadron made as if to get upwind of HMS Spartan. Captain Brenton ordered a change of course to frustrate this. At 07:45, the Ceres shortened sail and HMS Spartan did the same, reducing her speed. 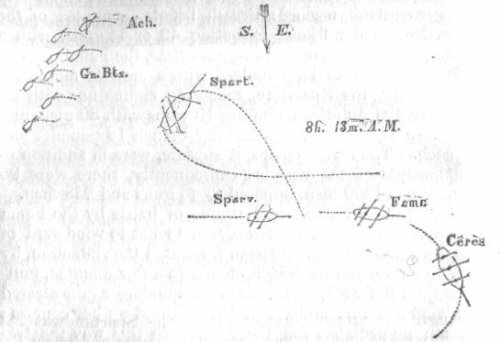 At 07:58, the Ceres was within a pistol shot of HNS Spartan's port bow and her guns began to fire in succession. Captain Brenton ordered that his gunners hold their fire until his ship was level with the enemy. When she was, HMS Spartan fired a treble-shotted broadside into the Ceres at point-blank range. The Swiss troops were formed up along the whole length of the ship in readiness for boarding and it was they who took the full force of HMS Spartan's devastating broadside. HMS Spartan then fired a full broadside into the Fama and the Sparviere in turn as she passed them. In the meantime, the gunboats and the cutter Achille had moved to the south-east and Captain Brenton manoeuvred his ship to cut them off from the others. Luffing up (that is, steering the ship directly into the wind, stopping her dead), she fired her foremost starboard side guns at the smaller vessel. She then hauled her stays (that is to position her sails to push the bow through the eye of the wind) and fired a broadside from her port side guns and at the same time, let the Sparviere have a broadside from the now-reloaded starboard side guns. At this stage, the Ceres should have moved to support the gunboats but instead, she headed off for the shelter afforded by the shore batteries at Baia. HMS Spartan's Action Against the Neopolitan Squadron. Positions of the ships at 08:00. Taken from the Naval Chronicle. HMS Spartan made to head after the frigate, but just before 09:00, the breeze died away completely. This disaster left her bow exposed to the starboard broadside of the Ceres. To make matters worse, the enemy brigantine and corvette were off her port bow and the cutter and gun-boats were coming up from astern and HMS Spartan came under heavy fire from all sides. Captain Brenton was standing on the quarterdeck capstan to get a better view when he was hit in the hip by grapeshot. After he was carried below to the cockpit, command devolved to Lieutenant Willes and it was he who commanded the ship for the rest of the action. Just after Captain Brenton was carried below, the wind rose and enablked HMS Spartan to get under way again. The same wind also allowed the enemy vessels to manoeuvre out of HMS Spartan's way. The cutter and the gunboats managed to get away, but HMS Spartan got into a perfect firing position against both the frigate and the corvette and let them have full broadsides from her starboard guns, badly damaging them both. One broadside from HMS Spartan brought down the Sparviere's main topmast. Unable to escape after the loss of her main topmast, the Sparviere surrendered. The rest of the Neopolitan squadron fled back into Naples. At 10:00 the Fama, also crippled by HMS Spartan'spowerful broadsides was rescued from sharing the Sparviere's fate by the gunboats which, under fire, towed her to safety. HMS Spartan's Action Against the Neopolitan Squadron. Positions of the ships at 10:00. Taken from the Naval Chronicle. HMS Spartan's Action Against the Neopolitan Squadron - the end of the action by Thomas Whitcome. Taken from a sketch by Captain Jahleel Brenton. HMS Spartan's crew quickly made running repairs to their ship and took the captured brigantine Sparviero in tow. Prince Murat, standing on the harbour wall waiting for his force to return to harbour with the captured British frigate in tow was totally humiliated when, not only did his force enter harbour beaten and damaged, but also by the sight of their target sailing up and down in the mouth of the bay in full view of the Prince with their prize in tow. In order to try to hide the abject failure of his force, Prince Murat commanded the local newspaper to print that the force could not have acted with more bravery and HMS Spartan was portrayed as a large frigate of 50 guns, thirty 24pdrs on her gundeck and 20 32pdr carronades on her upper deck. For his part in taking command of HMS Spartan after his captain had been wounded, Lieutenant Willes was promoted and appointed Master and Commander in the small brig-sloop HMS Leveret of 10 guns. Captain Brenton returned to the UK aboard his ship, but on recovering from his wounds, was found to be unfit for further sea service. Made a Baronet in 1812 and knighted in 1815, Jahleel Brenton was appointed Commissioner of the Dockyard at Port Mahon on Minorca and then the same position at the Cape of Good Hope before becoming Lieutenant Governor of the Naval Hospital at Greenwich. He died in 1844 having reached the rank of Vice-Admiral. In October 1810, Captain Jahleel Brenton's younger brother, Captain Edward Pelham Brenton was appointed to command HMS Spartan. Like his elder brother, the new captain was an experienced commander who had first held a command appointment as Master and Commander in the 16 gun ship-sloop HMS Calypso in 1802. His first appointment as a Captain had been in the ex-French 76 gun third rate ship of the line HMS Donegal, previously the French ship Hoche, captured at the Battle of Tory Island in 1798. His previous appointment to HMS Spartan had been in the 22 gun 6th rate post-ship HMS Cyane. On 8th July 1811, HMS Spartan left Portsmouth bound for Halifax, Nova Scotia to join the North America Station. This was being beefed up as a result of increasing tensions with the United States of America. 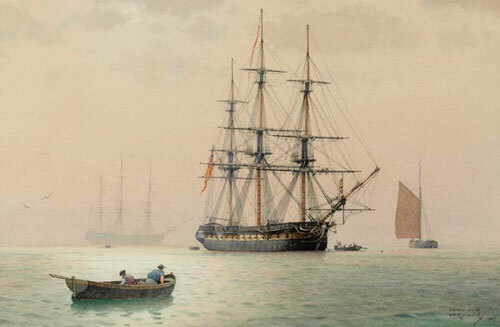 In April 1812, she was in Bermuda. On June 18th 1812, the United States of America declared war on Great Britain and the Royal Navy immediately put a blockade of the American East Coast into place. The Americans for their part only had a very small navy and relied a great deal on privateers to conduct commerce-raiding and blockade-running on their behalf. In the space of 3 days in July 1812, HMS Spartan captured three small American privateers; the schooner Active of 2 guns and 20 men off Cape Sable on 16th, the sloop Actress with 4 guns and 53 men off Cape St Mary on 18th and the following day, the schooner Intention of a single gun and 29 men off Annapolis. On 9th August 1812, she departed St Johns in company with a convoy but lost them in fog off cape Sable on 16th. On 17th October 1812, HMS Spartan in company with the 12pdr armed, fir-built 36 gun frigate HMS Maidstone captured the American privateer brig Rapid of 16 guns and 83 men on St Georges Bank. On 30th April 1813, HMS Spartan captured the brig Hector. 2nd June - the Portugese brig Flora and the American sloop Ploughboy and the American brig Commerce. 3rd June - the American sloop Express, the American brig Fanny and the Portugese brig Carlotta. 5th June - the American sloops Dispatch, Priscilla and George, 7 small coasters, the american schooner Betsey and the Portugese brig Flor de Lisbon. 6th June - the American sloop Morning Star and the American brig Hetty. 7th June - recaptured the brig Hero, out of Limerick bound for Lisbon with army stores and captured by the American privateer Globe. The three ships also captured the American schooner Belle, out of Madiera bound for Philadelphia in ballast. Also on that day, the American sloop Sally. 10th June - the Spanish schooner El Carmin bound for Havana with a cargo of flour. 15th June - the American schooner Farmer. On 20th August 1813, HMS Spartan departed Halifax with a convoy bound for Portsmouth, arriving on 27th September. In October 1813, HMS Spartan paid off at Portsmouth for long-overdue repairs. Captain Brenton was not to receive another appointment until April of 1815, when he was temporarily appointed to command the 100 gun first rate ship of the line HMS Royal Sovereign. In April 1814, HMS Spartan's repairs were complete, but the ship was not to be recommissioned until December when she recommissioned under Captain Phipps Hornby. Captain Hornby's previous appointment had been in command of the 18pdr armed 36 gun frigate HMS Stag. His first command appointment had been as Master and Commander in the 18 gun Cruiser Class brig-sloop HMS Minorca in 1806. The Napoleonic War was ended by the Treaty of Fontainebleu, signed on 11th April 1814. The war with the United States had reached a stalemate and both sides, weary of an expensive war that neither side really wanted or could afford, sent representatives to Ghent to negotiate a settlement. The negotiations started in August and the Treaty of Ghent was signed on 24th December. The British Parliament ratified it straight away, but the American Congress didn't do so until February 18th 1815. With the end of the war, HMS Spartan settled down to the peacetime role of a Royal Navy frigate in peacetime, that of enforcing British trade freedoms, stopping the slave trade and generally 'showing the flag'. In January 1821, HMS Spartan was paid off at Plymouth by her final commander, Captain William Furlong Wise. In April 1822, the ship was broken up in Plymouth.